PLEASE NOTE: ValveFX is currently backlogged on custom pedal orders until 12/10/2018. THANK YOU for your orders! ValveFX was founded in 2006. Mr. O’Hare and Jon Novembri had been building custom guitar effects since 2001, off and on for friends and other local guitar players whom wanted an edge to their tone, but also a rugged – no frills hand built pedal which would stand the trails of time on the road or on tour. 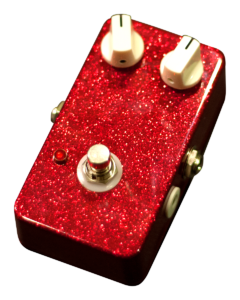 We are a small boutique shop producing top quality custom guitar pedals , and modified one off re creations of famous pedal designs. Most of our designs are based upon the best sounding pedals of the past, and modified to what we would consider our version of tonal perfection. Our designs use unique values and components used solely for the formation of great guitar tone. Often this is misinterpreted as component type, while important the value of the components that go into your sound is far more important to your sound. After playing with ValveFX pedals, many guitar players will often leave their favorite “go to” pedals in favor of our boutique versions which are often better sounding as well as more versatile. The ValveFX OD-2 & OD-3 are all analog guitar overdrive pedals, with pure vintage overdrive tone. It delivers the guitarist or bass player everything – from use as a simple volume overdrive, to a beautifully clean blues box with a touch of distortion, to an all out in your face distortion rich and fully sustained overdrive. Where OD-2 is your best option for a blues distortion pedal, OD-3 is for thick ZZ Top style blues, rock and high gain applications. 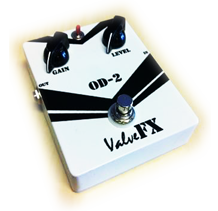 The ValveFX OD-3 pedal was also designed to ‘clean up’ distortion tone, and leave you with more sustain and a transparent volume boost. With the gain up all of the way, very loud ‘tube like’ rock distortion comes through. Nothing compares to this huge sounding overdrive! 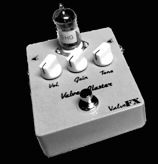 The ValveFX Valve Blaster is a 12AU7 or 12AX7 tube powered overdrive and pedal. This extremely versatile dual use guitar pedal will deliver awesome sounding tube overdrive and distortion tones, OR act as a stand alone tube preamp / volume boost, in a clean capacity. We highly recommend these as a solution for guitarists needing that “extra oomph” on their pedal board. Some use this unit also as a distortion box for overdriven tones, or to drive their favorite distortion pedal into sonic tube driven bliss. The VB-1 is one of our greatest tube-a-licious achievements. A tube driven volume boost (or preamp) with a gain stage was something we wanted to master for decades. Many hours, days and sleepless nights were spent finding the precise tonal formula for this unit, and when you plug into one you’ll hear our efforts. It’s not just good, it’s really, really good – like warm tube-a-licious good . 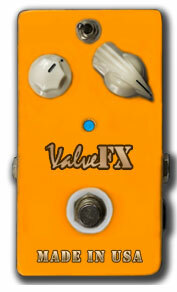 ALL VALVEFX PEDALS COME WITH A LIMITED LIFETIME WARRANTY WHICH COVERS REPAIRS , MINUS PART COSTS & SHIPPING. WE WILL ALWAYS HELP OUR CUSTOMERS WITH ALL UNITS SOLD . REPAIRS ARE OUR FIRST PRIORITY AND WE WILL HAVE YOUR PEDAL BACK TO YOU WITHIN 2 WEEKS OF RECEIPT . 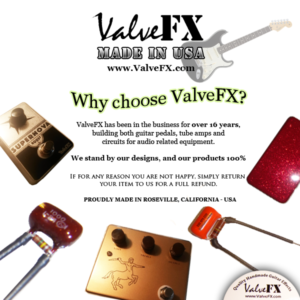 VALVEFX ONLY PRODUCES IN SMALL, LIMITED NUMBERS AND PEDALS CAN TAKE UP TO 2-3 MONTHS TO BE COMPLETED AND SHIPPED IN SOME CASES DUE TO MULTIPLE ORDERS FROM OTHER CUSTOMERS. WE OPERATE OUR BUSINESS ON A FIRST COME, FIRST SERVE BASIS. ALL TRADEMARKS OR NAMES MENTIONED ARE FOR REFERENCE ONLY.